never not dreaming: Sporty leather. Who said that sporty outfits include baggy sweats and a dirty white oversized t-shirt? I've decided to pimp it up and go for an all leather look. I paired up my black leather shorts with a white leather top. 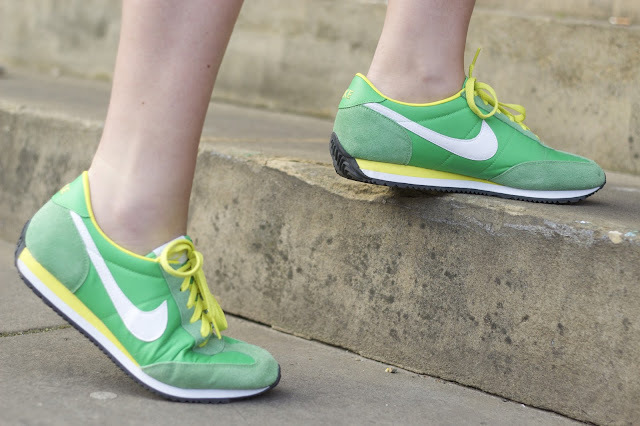 I am also wearing a pair of green Nike Oceania but, unfortunately, I took they risk of buying them on eBay and they are a bit too big for my feet... Oh well, they already have a new safe and loving home as I publish this post. The hunt for another pair is in progress! I hope you like that look. It is very comfortable and not too casual. A great look for a stroll on a warm summer evening or a casual pint on a Thursday night. What do you think?